Here's Bleu in all his glory, wearing the colors of his favorite basball team. Don't let his innocent look fool you, he has just committed unspeakable acts against our furniture, and is trying to lull me into a false sense of security so he can rummage through the trash. This is Bleu. 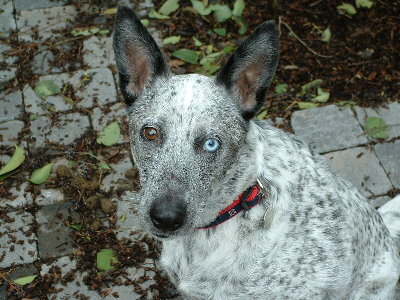 He's an Australian cattle dog. Part Queensland Blue Heeler part Dingo, and all trouble, with a few other things thrown in for fun... Deaf from birth, he has been quite the hand full. He craves constant attention, has an ongoing battle with our vertical blinds, and will eat anything left unattended, with the breath to prove it. We acquired him through an animal shelter in Northern California, and life has not been the same ever since! This site will attempt to educate, and provide resources for pet adoption and care. While living with the deaf dingo has been a blast, and I would have little hesitation in recommending it, deaf animals do have unique challenges and needs, so buyer beware!